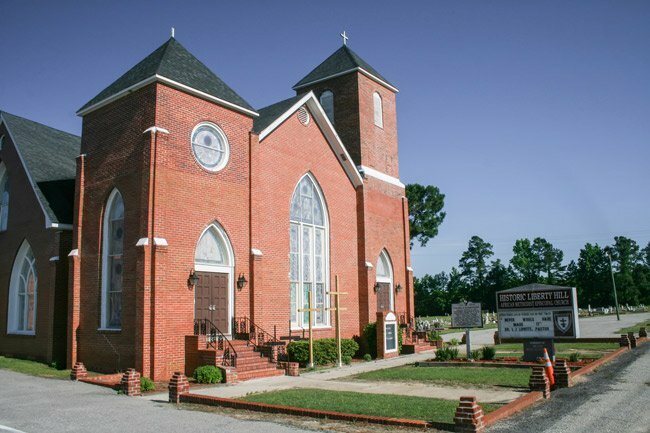 Liberty Hill AME Church in Summerton was founded in 1867, four years after Emancipation and two years after the close of the Civil War. Members originally met in a bush arbor and later a shed. The first formal sanctuary built on this site was constructed after Thomas and Margaret Briggs sold four areas of land to church trustees for $1, though the date is unclear. The current church – New Liberty Hill, as parishioners call it – was completed in 1905 as a wood-frame building. Brick veneer was added in the 1940s. Around this time, in the late 1940s, people began meeting here to discuss desegregation. The meetings were led by Liberty Hill’s then-minster, the Reverend E.E. Richburg, and evolved into the landmark case, Briggs versus Elliott. 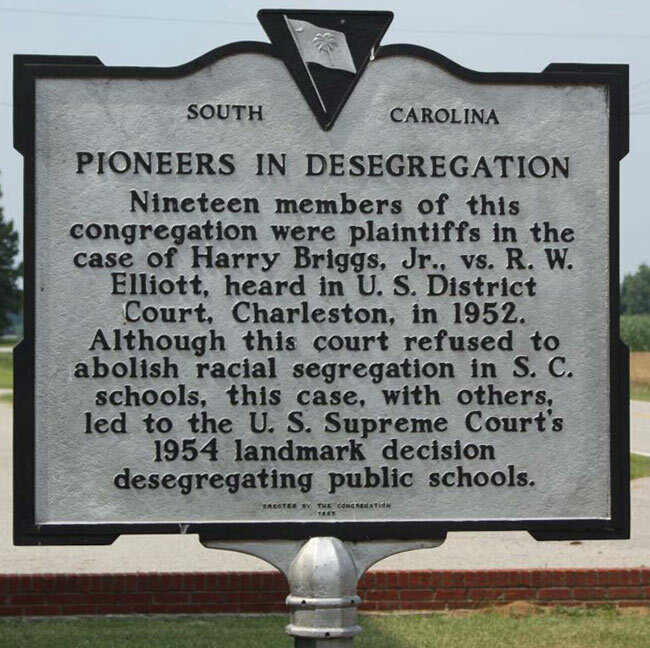 The case officially began in 1949 when Harry and Eliza Briggs of Summerton, along with more than 20 other plaintiffs – including the Briggs’ eight-year-old son, Harry Briggs, Jr. – signed a petition asking Clarendon County School District #22 to provide black schools that were equal to their white counterparts. Their schools, they wrote, should also be equipped with heat, running water, electricity, adequate furniture, and books. The petition was organized by local black minister and teacher, the Reverend Joseph Albert DeLaine. School superintendent Roderick Elliott denied the request. The case was appealed to the United States Supreme Court, and Briggs versus Elliott was the first of five cases that together became Brown versus Board of Education of Topeka, Kansas in 1952. In fact, the court later stated that it chose Brown versus the Board of Education as the case’s name only because it did not want the case to be seen by the nation as Southern. In fact, in 1954 there were 17 states that required segregated schools, with only Delaware, Maryland, West Virginia, and the District of Columbia being outside the South. A victory was handed to the plaintiffs on May 17, 1954. 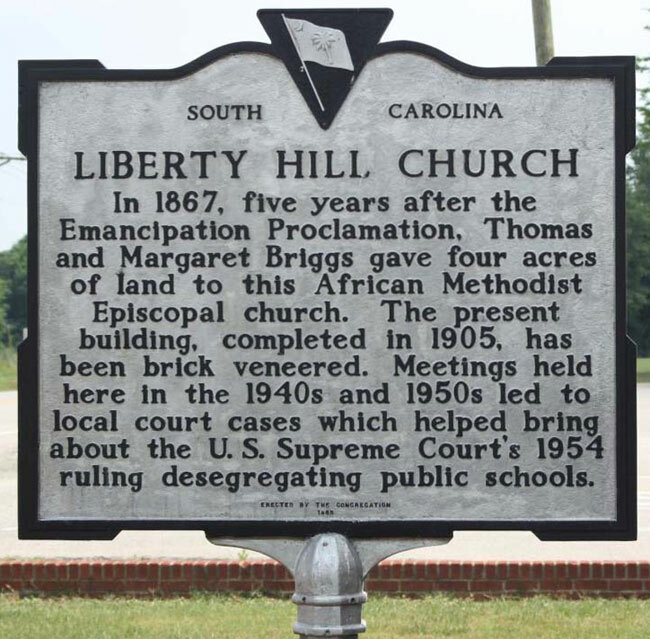 While Briggs versus Elliott ultimately was a win for desegregation, the pioneers from Liberty Hill AME Church were greatly persecuted by their neighbors as a result. All of the plaintiffs were fired from their jobs, and the Reverend DeLaine’s home and church were burned in retribution. Many of them, including Harry and Eliza Briggs and their children, left the state. Harry and Eliza Briggs each received a Congressional Gold Medal posthumously in 2004, along with the Reverend DeLaine. Harry Briggs, Jr. lived out his years in New York; he died on August 9, 2016. 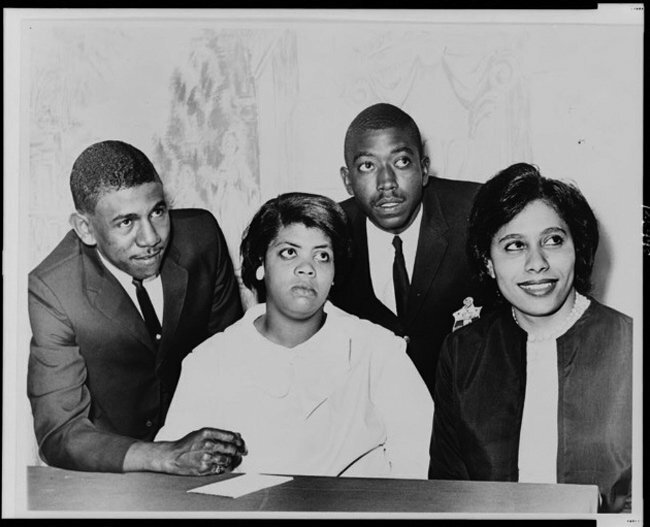 Below is a photo from 1964 featuring some of the plaintiffs in Brown versus Board of Education, including Harry Briggs, Jr., pictured second from right. Today Liberty Hill remains an active AME church with a history rich in courage, suffering, victory, and faith. The Judicial Annex behind the United States Post Office in Charleston was renamed for Judge Waring on October 2, 2015. 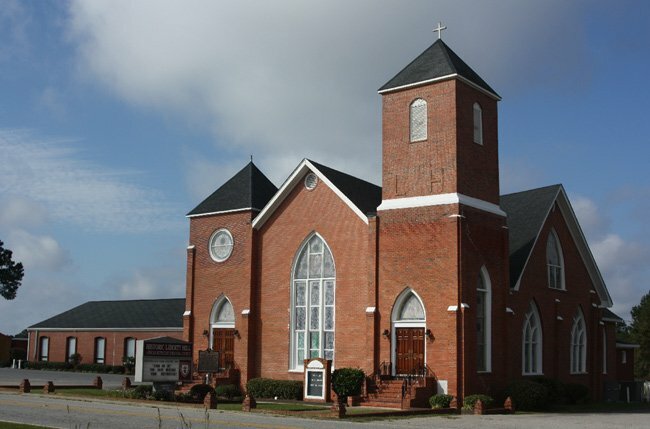 BEST WISHES to my Family Pastor, the Reverend Robert China, and his lovely family who has been assigned to this wonderful, magnificent church, Liberty Hill AME Church in Summerton, SC. Rev. China and family, you will be truly missed, and on behalf of my family: thank you for being our family pastor at Springhill AME Church in Lexington for 20 YEARS, and for the wonderful work you & your family have done. We send you blessings and all the best with your new endeavors and adventures in God's work at Liberty.